That right there is a formula for investment success. 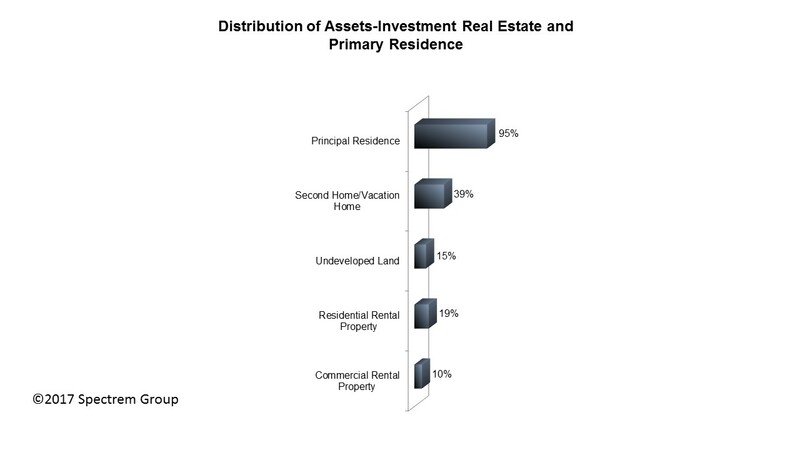 According to Spectrem’s annual wealth segmentation study on the portfolios of affluent investors, between 6-7 percent of an investor’s assets are in real estate, not including the investor’s principal residence. That percentage has been the same since 2010 when the recovery from the 2008 recession was beginning to occur. Real estate is not by nature a short-term investment, unless the investor is a property flipper by trade, with the plan to improve the property quickly and resell it. Instead, real estate increases in value slowly but is not a market that suffers from current events or political maneuvers. While housing is a fluctuating market, real estate is not. According to Spectrem’s study Asset Allocation, Portfolios and Primary Providers, among UHNW investors, almost 40 percent own a second or vacation home. There are obvious personal pleasure reasons for owning a second home, but it is also a way to put a significant sum of money into a property that often has a very high resell value. Among the less wealthy Millionaire investors, 22 percent own second homes. Another frequent form of real estate investing is in owning residential rental property. Among Millionaires, 12 percent own rental property and among UHNW investors it is 19 percent. This is another form of investment that requires research, because the investor is in effect becoming a landlord if they are the lead investor, and landlords must hire managers and handymen to maintain the property and the rental status of units. Real Estate Investment Trusts, on the other hand, are investment in real estate but the investor is not so aligned with one piece of property.